The Challenger 2 is Retired. Thank You All. This is going to be a long post, but it needs to start and end with a thank you. When I took the Challenger 2 out of storage eight years ago, I had a chassis, some bodywork, and a lot of half-baked ideas about how to resurrect my dad’s old car as a world class streamliner. It was the hardest thing I’ve ever done, and it would have been impossible without the support and enthusiasm of racing fans all over the world. You helped me find my team, drove media interest, and made it clear to sponsors that we were a horse worth backing. My wife Valerie calls C2 the people’s car, and that’s exactly how I feel about it. You all came on this journey with me, and I’ll always be grateful for that. I consider myself a pretty lucky guy, but the best piece of good fortune I’ve had is stumbling across my crew. These guys are the best in the world at what they do, and for the past four years, every single one of them has been a volunteer. They sacrificed their weekends, holidays, and pocketbooks to chase this dream with me, and I quite literally trust them with my life. When they strap me in and tell me the car is ready, I know I’m good to go. We made a quick video about most of the team members a year or so ago, and I hope you’ll watch it if you get a chance. These guys and gals are the real deal. After we got back from Speed Week this year, we collected all our time slips and typed them up on a spreadsheet, which I’ve embedded below. It’s hard to believe, but the C2 has only made 10 passes on a full length course. I’m not going to lie—I’m very proud of these numbers. As a competitive streamliner, the car is, for obvious reasons, pretty old fashioned. It’s difficult to service, the dual-engines are a nightmare for turnaround, and we’re missing a lot of safety features like traction control. For the record, had I built a car from scratch, I would have changed all of that. But that wasn’t an option, so my team and I made a bet on old-school, balls-to-the-walls horsepower, and I think it was a good call. If you’re going to be pushing a stick through the air, you might as well push like hell. And we did. People often ask me how fast I think the car could go under ideal conditions, and the fact of the matter is, I don’t know. If you look at the bottom line of the spreadsheet, it’s pretty clear that our last run was by far our fastest ever in terms of acceleration. If I hadn’t been sliding all over the course after the four, I think the final number would have been even stronger. In short, by walking away from the car now, I may very well be leaving some speed on the table. That said, I am walking away, which might not be the case if I go for another lock-to-lock joy ride at 430mph. So is that why I’m retiring the car? No. It’s more prosaic than that. It’s the money. I should have stopped two years ago. If I was really smart, I probably wouldn’t have started. Our sponsors have been incredible, but like a lot of racers, a significant portion of this came out of my own pocket, and not in a way that was sustainable. A huge thank you to my wife Valerie for tolerating that. Dreams come at a high cost, often more than you think or planned for, but I strongly believe they’re worth pursuing. If you’ve got a bucket list, get started emptying it. I’m 69 years old! It’s not too late. So what did I get out of this whole thing? As of today, the Challenger 2 is the fastest piston driven record holder. Which isn’t really a thing by the way. It’s not a class, or an official title, or something you get a trophy for. But it’s what I’ve wanted from day one of the project, because it’s what MT and I believed the car had the potential to be. And if someone breaks the 448mph average tomorrow, that’s perfectly fine, that’s racing, that’s as it should be. 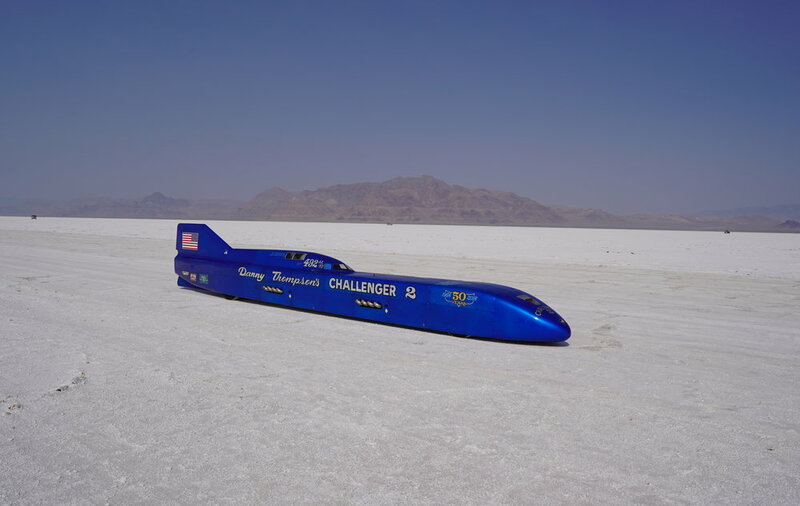 Bonneville is the greatest amateur sporting arena in the world, and we’re all chasing speed like our lives depend on it. I’m going to be on the sidelines now, rooting for everyone. And based on some of the numbers that came out of this year’s Speed Week, there’s a lot to look forward to. I’ve got to end with a word about family. I was supposed to rebuild the C2 with my dad. We didn’t get the chance to make that happen. But I know he was with me in the cockpit, and his name was right next to mine on the canopy. And when I broke the record, my mom, my wife, and my son were outside the car waiting for me. So let me say it one more time: thank you. The title says it all! The Challenger 2 recording a blistering 446.605mph pass for the opening day of Speed Week. Danny said it was a pretty hairy ride (and our GoPro footage backs that up), but overall, the team couldn't be happier with today's performance. The streamliner has never gone faster, and despite a broken valve spring, the crew was able to get everything fixed-up and tip-top within the four hours they were permitted to work on the car in the impound area. If you'd like to hear more about everything that happened today, please listen to tonight's podcast, which is embedded below this post (press the little triangle to play). Tomorrow is another huge day for the team, and we'll be starting early. In order to clinch a new record, we need to make a successful backup pass. We're planning on lining up as early as possible, and hope to be at the start line and ready-to-roll by 7AM. If you'd like to follow along live, you can head over to our Twitter account for updates, or listen to the livestream from the tower, which is available online this year. Otherwise, check back here later in the evening for a full update. As always, thanks for supporting Thompsonlsr! All photos (except for the time slip) by Bubb Lannan. Today was the crew's first full day on the salt. We finished setting up the pits, push-tested the C2's steering, and completed our final preparations for tomorrow’s run. Underneath this post you’ll find a few snapshots of the day's events, as well as a brief podcast in which Danny discusses the track conditions (spoiler: things are looking pretty darn good). Tomorrow's pass will take place in the morning, likely within an hour or so of the mandatory SCTA driver's meeting. We're shooting for around 10:30AM, but that may change slightly. To follow along live, head over to our Twitter account for up-to-the-minute news from the starting line. Otherwise, check back here later in the evening for a full update. We're excited to be celebrating the Challenger 2's 50th anniversary at this year's SCTA Speed Week competition. The event is held on Utah's Bonneville Salt Flats, and is scheduled August 11-17th. If you're able to attend in person, we plan (conditions permitting) on making our first run on the morning of Saturday, August 11th. We try to be one of the earliest cars off the line, so be sure to head to the start area after the driver's meeting if you want to catch us. Can't attend in person? No problem! For live updates from the start line, head to Twitter. If you're just interested in major news, we'll post that on Facebook and Instagram. For in-depth nightly posts, including pictures and a brief podcast featuring Danny, you're already in the right place! We'll post those right here on our news page. The team and I are heartbroken to relay the news that we’ve lost a great friend and principal crew member, Eric “The Big Guy” Hoenig. Those of you who’ve been following our project for years know how much of a struggle it was to rebuild the Challenger 2. In the middle of that difficult process, Eric miraculously dropped into our lives. He wanted to help, and it didn’t take long for us to discover that there was nothing too big or too small for The Big Guy. Before we knew it, he was an essential member of the team. When we were racing, he handled the nitro. When we weren’t, he was doing anything else he could think of, always giving his all and never asking for anything in return. We have more than 25 crew members, and every single one of them loved and respected him. He was a terrific friend to Valerie and myself, and we already miss him terribly. Thanks for everything E-man. We couldn’t have done this without you. Happy New Year everyone! 2018 marks the 50th anniversary of the Challenger 2. My dad, the whiz-kids at Kar Kraft, and some of the best hodrodders California ever spawned built the car over a frentic six-month period in 1968. It took my crew and I a fair bit longer to get it back into shape, but by 2016 we had a 400mph+ AA/FS record, and in 2017 we reached our highest speed ever, 435mph. We seriously considered retiring the car last year, but it seemed like a shame to miss the anniversary, and the whole team felt that higher speeds were attainable. After ruminating on it, we decided that the C2 probably had one more year in her. That in mind, I’m pleased to announce that we’ll be returning to Bonneville for Speed Week 2018. The event will take place between August 11th and August 17th. Hopefully the weather will cooperate, and we’ll have access to a better racing surface than we’ve gotten over the last couple of years. We don’t currently have plans to participate in any other events, but as always, we’ll see how things shake out. As some of you probably recall, the SCTA’s World Finals event was cancelled last year due to rain. It was devastating news at the time, but it did mean that the streamliner has basically been race ready since September. That said, it’s hard not to tinker, and Valerie and I have made a few modifications and upgrades since then. We completed a more thorough repair of the nose cone, which was damaged during Speed Week (minutes before our fastest run in fact—Terry and Eric actually finished repairing it on the line). We also replaced a large portion of the aluminum belly pan, which had been damaged over time due to salt exposure. Finally, we switched out the previous seatbelt system with a new set from Crow Safety. They make great stuff. Along those lines, racing, as I’m sure all of you know, is expensive. We have terrific sponsors, but the beast is always hungry, so we are looking for new partners for our 2018 runs. If you know an individual or company that might be interested in coming on board, please get in touch using our contact page. That’s it for now. We hope to see all of you out on the salt this year, but if you can’t make it, we’ll be sure to keep you up-to-date with the Challenger 2 here on our website, as well as on our social media channels. Here’s to a fast (and safe) 2018! Our new podcast is here, and this time we enhanced it with visuals from this year's Speed Week event. The main topic of discussion is the crew, and how crucial they are to the project's success. It's worth noting that this conversation happened organically--Danny was speaking off the top of his head. As a result, a few team members didn't get the focus that their contributions merit. That said, hopefully Danny got across the general message that the Challenger 2 is powered by a team of dedicated individuals, not just the driver. In this podcast update, Danny discusses the full extent of the front engine failure, the condition of the course, and his plans for the SCTA World Finals event in October. If you'd like to see things as they happened, the videos of the unsuccessful backup run are now available on our YouTube channel.